We know that Jacques Bunel was born Lucien Bunel but we know remarkably little else about his childhood. We know that he became a Roman Catholic priest and member of the Carmelite order and took the name Jacques de Jesus.Jacques served as a minister of the Faith he confessed and loved by becoming headmaster of a school in Avon, France. This school was known as Petit Collège Sainte-Thérèse de l’ Enfant-Jésus. From this refuge he would engage in the activities that make him laudable but also cost him his life. As the Nazi scourge swept through Europe, Jacques found a way to resist the Nazi empire nonviolently and in a way that would save lives. Jacques began his revolutionary life saving by offering three spots at his school to three Jewish boys whom he helped assume false identities and names. These three boys were named Hans-Helmut Michel, Jacques-France Halpern, and Maurice Schlosser and would be part of the reason that the Nazis would eventually murder Jacques. Had Jacques known that protecting these three boys would cost him his life it seems that he would have done it anyway. Unlike many other clerics and Christians, Jacques was not blind to the atrocities being perpetrated and was willing to risk everything to be on the side of the righteous and loving. Looking at the faces of the children he protected, Jacques knew he was offering refuge to his savior. The boys and Lucien Weil died in Auschwitz. Jacques was transferred from camp to camp before ending up in Mauthausen in May of 1945. Wherever he went he was known as optimistic and hopeful for liberation. Further, he encouraged his fellow prisoners to share their food and encourage each other. Often, he would go without food so that others might eat. This was near the end of the war and liberation was steadily coming to the camps as the Allied forces beat back the Nazi empire. When Mauthausen was liberated Jacques did a curious thing. He was suffering from tuberculosis and weighed less than 80 pounds when the liberating forces came but he insisted that the others be liberated first. He waited until he knew that all others had gone before him before he consented to be liberated from the hell that the Nazis had engineered for him and other innocents. He died from his illness before he ever made it back to France. His body was shipped back to the school he loved and buried on the grounds of the refuge God had gifted him so that he might try to protect others. Those whom Jacques protected were still murdered by those whom Jacques resisted but he offered love and protection as a testament to the right place of the Church in opposition to great evil. Jacques died a martyr whose death confessed greater allegiance to the Kingdom than to himself. Babylas had been a leader of the Church in Antioch. In fact, he was presiding over the Easter vigil and services in the year that the emperor Philip tried to coerce the Church into siding with him. Philip had feigned faith for years and continued to worship the civil religion when he thought he could get away with it. The Church was willing to have him show up but was not willing to make him an object of worship or adoration–when he walked through the Church doors he was nothing more than another sinner seeking grace. In Philip’s case, it’s dubious that he was ever seeking grace and much more likely that he was interested in covering over his political machinations with the clothing of the Church. Babylas was unwilling to allow it. When Philip came to the vigil, Babylas met him at the door and tried to save him some shame. Philip asked to be let in and Babylas shook his head sadly and said, “You can only enter if you’ll come as a penitent.” Philip was uninterested in taking the position of one seeking forgiveness for and healing from sin. It would lower him to be with the people whom he ruled and would not give him the honor he was so confident he deserved. When Philip insisted that he be let in as an honored guest, Babylas was undeterred from his refusal. The tension in the moment only got worse as Philip waited for Babylas to crack and relent. When Philip indicated his armed guards and attempted to coerce Babylas with worldly power and threat it came as a surprise to Philip–but no surprise to those who knew Babylas–when Babylas closed the doors and barred them to the unrepentant emperor. If Philip would not repent from his sins and come seeking grace then the door was to be barred to him as the Church could not honor or esteem one who was not aware of his own sickness–after all, Jesus came for the sick and not for the well. Babylas paid a price for this and Philip had him arrested, chained, and thrown in prison. He was left to rot in jail alone and constantly chained. He continued his life of devotion and prayer under chains and persecution because he had been called to it regardless of the cost. Occasionally, he was allowed visitors from the Church and they would secret the Eucharist to him so that he might remain part of the communion he had given himself for but he was never allowed out of his chains. His chains were supposed to serve as an ever present reminder of the Empire’s ability to punish those who resisted it but for Babylas they were a reminder of the weight of sin upon the soul and the need of healing within the Empire. When Decius took power and the Decian persecutions began, Babylas was martyred as he was already within the iron grip of the Empire that wanted to eliminate Christians. He was one of the first and was buried in his chains as he had requested of his Christian brothers and sisters. The persecutions that Diocletian engineered within the Roman Empire are still looked back upon with a sickly amazement. Diocletian engaged in a dance of death that was meant to bully and coerce Christians into denying their faith or simply failing to live it out. Either of these options was fine by Diocletian since his goal was the termination of Christ’s followers and both outcomes poisoned and assassinated Christian faith. Of course, if they wouldn’t do these things, then they would die at the hands of the Empire in an attempt to lessen the number of influential Christians. This is where Diocletian failed to understand his enemies–the death of a martyr may have weakened the weak but it only strengthened the faithful.Further, it propelled the martyr’s story into public consideration because of the oddity of their willing death. Since most the martyrs died willingly and most died without offering any resistance, the people who witnessed or heard about their deaths began to ask the questions that led to eventual faith. Every time the Empire punished and killed a martyr they only spread the Christian infection further. Jesus appeared to Absadah who was amazed that any could enter into his home. Speaking to Absadah Jesus said, “No security can repel me, Absadah, and no persecution can truly kill me for I am the resurrection and the life.” Absadah was immediately aware of what he had been doing–trading faith, hope, and love for security, chance, and fear. Jesus called Absadah to live the life he had already committed to live as a servant and disciple of life and love itself. So, Absadah’s security was infiltrated by Jesus and left him with only two options: deny his faith or learn again to trust the God who had been executed. He left his home and went to the officers. He turned himself in as a Christian and set an example for his little flock. They arrested and tried him and found him guilty of trusting a power of which the Empire did not approve. He was beheaded outside of Alexandria to frighten others–but they only succeeded in spreading a gospel that proclaimed life to the dead and hope to the frightened. Nino felt a calling to go to Iberia–in fact, she had had a vision commanding her to take what little she had and travel east to the land that would eventually be known as Georgia. But there was one very significant impediment to Nino’s missionary calling: she was a slave and, according to the Roman powers, her life was not her own to direct. She had quite a pedigree being related to notable and powerful leaders both within the Church and without it, yet she had been taken captive from Armenia and brought to Constantinople as a servant. However, this did not lessen the intensity of her calling. The words of Mary in her vision still rung in Nino’s ears: “Go to Iberia and share the good news that is accomplished in Jesus Christ. I will take every step before you do and be your shield against enemies you’ll know and some you’ll never know. Take a cross and plant it in a land to proclaim salvation and life through my beloved Son and Lord.” So, somehow–some way–Nino risked much to leave and do God’s work in a land where she had no connection. When she crossed the border into Iberia she began looking for a town–any place where people would congregate–and she settled there. She planted the cross she carried into the ground and began preaching a Gospel that so few had heard in the little town. The fires of conversion caught in the tiny town and soon Nino’s message was spreading into the larger cities and eventually arriving in the capitol. When the queen heard Nino’s message she was transfixed and requested an audience. Nino–the slave–went to speak with the queen and share a faith that depended upon a crucified king. When she arrived, she discovered that the queen was ill and not responding to the cures of the greatest of the royal physicians. Nino offered a humble but earnest prayer on behalf of the queen and she was healed.The two women conversed. We don’t know what was said but the queen was converted and this created a pathway to speak with the king. The king was tolerant of his wife’s conversion but was not personally persuaded that day. It would take another set of circumstances. The king–like so many other members of the royal class–had a passion for hunting. One day while he was in a nearby forest, he descended further into the forest than he had ever traveled. Soon, he was surrounded by unfamiliar streams and rocks and realized that he wasn’t entirely sure how to find his way back out. He began tracking his path to discover his escape when he was suddenly struck blind. Lost deep in a forest, blinded, and surrounded by animals that would eventually overcome their timidity to inspect and perhaps kill a disabled man, he began to fear for his life. His thoughts flew to Nino and Nino’s God and he prayed a simple prayer: “Jesus, if you are indeed God like the slave says, then save me from my darkness so that I might abandon all other gods and allegiances to follow and worship you.” With the sounding of his “amen” his sight returned and he beat a hasty retreat to his palace. When he arrived, he called for Nino and was converted. Soon thereafter, Christianity became acceptable in Iberia and was no longer punished. The king and queen were taught by Nino but Christianity was exploding in Iberia and the king recognized that more teachers and ministers were needed to accommodate the needs of the growing community of Jesus’ disciples. Emperor Constantine sent a bishop and ministers to Iberia and a great church was built there. Nino could see that the Church had gained a foothold in Iberia and so she retired to a small hermitage in the mountains where she could again devote herself to prayer and service. When she died, the king built a monastery by her grave and continued to tell the story of the slave who had freed a kingdom. Nicholas Herman struggled with poverty. He had trouble finding enough money to afford to live in seventeenth century France. So, he enlisted in the military and went to fight for France in the Thirty Years War. The war had been going on for nearly fifteen years by the time Nicholas joined its ranks and prepared to fight for as long as meals and a small stipend would be provided to him. It wasn’t what he had wanted to do–few at the time would have volunteered to fight a war if there was no economic incentive–but it helped provide for his needs. He was devoted to the Faith he was raised in but found life unsavory and wondered if he might be missing something in his own everyday Christian life. But, while afield with the military, he had a vision that would change his life for the better. Nicholas was looking about himself in the middle of a very cold winter. A tree barren of all leaves stood resolutely before Nicholas’ gaze and seemed to cry out for notice and consideration. Nicholas’ mind drifted toward the eventual full bloom that awaited the tree come summer and he held the image before him in tension with what he knew awaited the tree standing barren and steadfast among death and destruction. In the tree, Nicholas saw his bleak existence and in its hope he saw his own: a hope that relied upon God’s good grace and steadfast love. Though life was hard and desperate for young Nicholas he was filled with hope for a life consisting in deep love between creator and creation. In a barren tree, God had reached down and touched Nicholas’ heart with a vision that granted hope and strengthened his persistence. When he was discharged from the military, he went to a Carmelite monastery and petitioned to become a brother.Because of his relative lack of education he could not become a cleric but he persisted and became a lay brother and was assigned to work in the kitchen. His duties included cooking, cleaning, and serving–in other words, he was called to sustain the monks and he did so gladly. He took the name of Brother Lawrence of the Resurrection upon entering the monastery. But, his culinary skills are not what he is best known for. Rather, he is known as a fantastic proponent of the power of love. He insisted that the many works of men and women to explain and grasp the love of God were unnecessary. There was a simple way of life and love that Lawrence called his friends and colleagues to: loving God in the everyday moments.Instead of doing great and big things to “earn” the love of God, Lawrence endeavored simply to appreciate God’s steadfast love in the small things. When he was cooking a meal, he thought of himself as cooking for God and with God. When he scrubbed a pot or a pan, he was doing it for and with God. Lawrence had an intimate and deeply personal relationship with God and advised all of his friends and colleagues to do the same no matter what else they might be doing with their lives. After all, Lawrence knew well that there was only hope for life in the love that animated and sustained all of creation. Though he was a barren tree hoping desperately for summer, he knew that God was already effecting a summer in his soul and this love informed all of Lawrence’s actions. His many sayings and teachings on God’s love and presence were gathered together by people who appreciated them after his death and bound together in a text known as The Practice of the Presence of God. There was no other calling for Lawrence than this: to know and be loved by the God who gave hope and faith to God’s much loved creation. Elizabeth Ann Bayley was the daughter of a successful doctor and professor of anatomy at Columbia College in New York city. Her father had been a powerful man of influence and generosity who had insisted upon raising his children–first with Elizabeth’s mother who died when she was three, and secondly with his new wife–in the Church (specifically, the Episcopal church). She became the wife of William Seton–an affluent businessman–at the age of nineteen and had five children before tragedy struck the young family. Several lost ships meant the loss of the business that provided for their needs. On the heels of their impoverishment, William took ill.Elizabeth went with him to Italy when the doctors suggested he take a vacation for his health and was there when he died young and in a faraway land. She was taken in by a wealthy and loving Roman Catholic family that saw her tragic circumstances and wanted to breathe a little hope into an otherwise bleak situation. While mourning and grieving, she began to have conversations with her magnanimous hosts and found herself becoming more and more connected to the parish they attended. Eventually, she became a Roman Catholic. Therefore, it was as a Roman Catholic that Elizabeth returned to the States–specifically Maryland–and tried to pick up the fractured pieces of what remained of her life. When she arrived in the States she expected to wade back into family relationships that would provide a loving embrace of support but found nothing to aid her.Her family relationships had soured with her change to Roman Catholicism and so she found herself an impoverished and grieving woman with five children to support in a hostile environment. It would have been easy to give up on what she believed and professed but, instead, she committed to do something incredible. She built a Roman Catholic school and supplied her family from the meager income it provided her. It seemed that a success story had been begun out of the ashes of destruction. But it failed. The first school she started failed miserably because of anti-Roman-Catholic sentiment. Given all that had befallen her, it is amazing that she pushed on and somehow endeavored to establish the first free school in the United States. She found a life of charity and generosity to be fulfilling but also commanding. She provided free education in a system designed to inhibit it. It was an incredible feat but it seems that Elizabeth never knew just how impossible her calling was. Instead, she strove to do what it was that God had called her to do in spite of adversity and resistance. Religious orders and schools sprung up in the wake of her daring faith and hope and the world was changed ever so slightly for the better because of one grieving woman’s efforts to provide not only for her own children but also the children and future of a nation. She died at the age of 46 at the hand of tuberculosis. Alex had to come down to the lobby to let us into his building, but we were glad to wait. As we all rode the slightly-too-small elevator up to the fourth floor, I couldn’t help but compare his current building with the building where he lived when we met him. Alex was a resident of the building we took to calling “Little Calcutta” because of its utterly dilapidated condition and unjust administration. Alex was one of the leaders who lived there and helped his brothers and sisters to stay strong when the owners first refused and eventually retaliated to the requests of the tenants. One of the gifts God gave Alex that he used to support his brothers and sisters is the same one that brought us to his new place months later: a spectacular gift for cooking. With the soft ding of the elevator, our attention turned to the meal that awaited us all in Alex’s new home. A first born son of Puerto Rican heritage, raised in East Harlem, Alex started learning to cook as a child. Describing himself as a “latchkey kid,” he once told me that when he was a child, he learned: “If I didn’t cook, I wouldn’t eat.” Though it wasn’t a straight path Alex took to get there, he eventually ended up in culinary school in New York City, learning even more not only about cooking high quality food, but also about the power of a meal to create and sustain community. Both in East Harlem and in culinary school, he was learning the practice of hospitality by so many other names. As we walked down the hall to his corner apartment—only a few blocks away from Little Calcutta physically, but miles away spiritually—we gave thanks for his hospitality a little more with every step toward the fragrant banquet awaiting us. Some people might say that Alex ended up in Danville by accident, but we know the truth. God brought Alex to Danville by way of a winding path through addiction, recovery, loss, and at the encouragement of his children. In our experience, God loves the winding path and God loves making a way through the wilderness. As we all listened happily to the menu for that night’s meal, I couldn’t help but recall that it was food that first introduced us to Alex, when we ended up bringing lunch by Little Calcutta. He joined us for that lunch and many others, before eventually telling us why he kept showing up: “I saw you guys coming to eat, and I just liked the fact that you guys weren’t just helping but also just being there. I needed someone to talk to. I needed it more than a plate of food. I liked the fact that it was more about relationships than food.” That’s saying something for somebody who loves good food like Chef Alex. We’ve hosted hundreds upon hundreds of meals since the leaders of Grace and Main first made our commitment to a life of hospitality, prayer, simplicity, and community building. But, as we broke bread, passed the cup, and bowed our heads to give thanks for the meal, we did so with special gratitude for the unexpected grace of this particular meal. We’ve hosted many meals and seen lives slowly changed over spoons clinking softly in bowls, but we’ve learned that being committed to hospitality is about more than hosting meals. 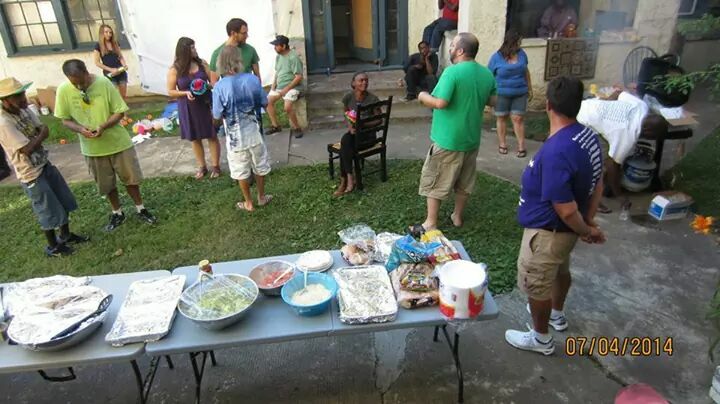 As we try to give our lives over to welcome and building family on the margins, we’ve learned something: our commitment to hospitality doesn’t make us hosts, it makes us witnesses. What Alex reminded us with broiled fish and a delicately seasoned butternut squash soup was that all good gifts come from God above. God isn’t anxiously waiting on any of us in order to do something, but is in fact inviting us to see what God is already doing with seemingly misplaced chefs and carpenters, teachers and preachers, doctors and the sick. God’s call upon our lives is not some desperate hope that somebody might do what the Kingdom needs, but is an invitation to a better and more blessed way of life. God is the host and we are the guests and witnesses of God’s goodness, whether it’s in “our” homes, in the homes of formerly homeless brothers and sisters, or on a street corner or porch. The meal that night was quiet for a while, except for the babbling of my only-recently-started-crawling daughter, but only because the meal was one of the best we’ve ever had. A few more than a dozen people gathered around a couple of tables marveled at what Alex did with relatively meager, but fresh, ingredients. Most of those gathered had lived in Little Calcutta and were nearly anonymous victors over the injustice there. They had eaten at Chef Alex’s table many times when food was tight and money was tighter. But this night, there was only celebration. Brothers and sisters, who once had nowhere to lay their head, ate a meal together and told stories about Little Calcutta—a place no one wanted to return to, but where the Spirit had moved anyway. As the meal dissipated, we carried our laughter and joy back down the hall to the elevator and to our cars. Having been guests at Chef Alex’s table, we were pleased to find that once again we had been witnesses to God’s goodness. 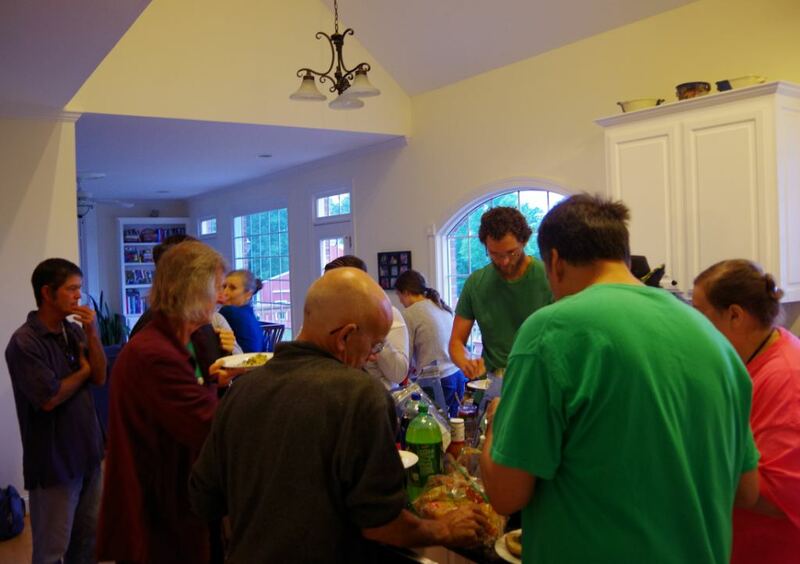 That night, we gave thanks not only for good food, but also for each other and all the winding paths that God used to bring us all together in the home of a formerly homeless man with a penchant for holy mischief. It might not have been the fanciest meal in the city that night, but I’m pretty sure it was the best one.